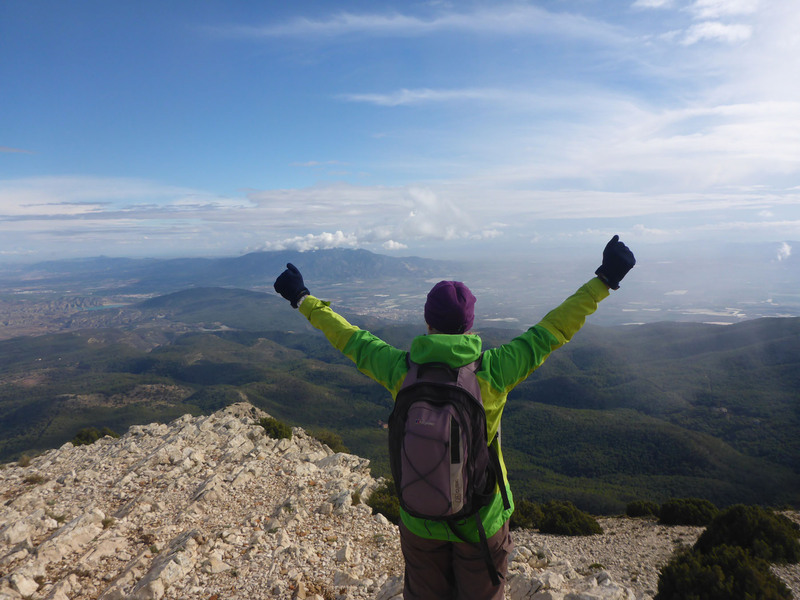 After Casares, we initially planned to spend a few days exploring the Costa del Sol. 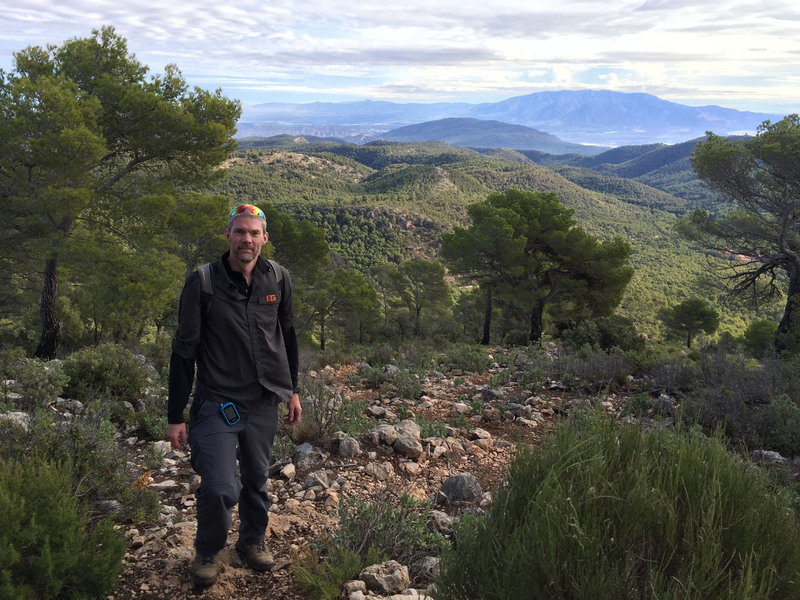 We passed Estepona, then stopped for an hour in Puerto Banus, a marina town that I knew reasonably well from a previous life, but after a quick explore we decided to move on. 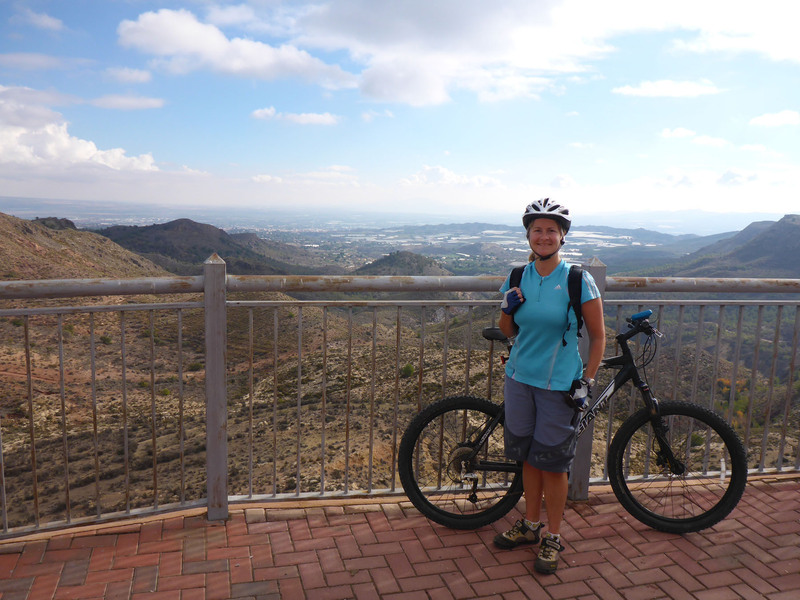 We then quickly passed through Marbella, Fuengirola, Benalmádena and Torremolinos, with the shock of high rise development and tacky apartments driving us briskly onwards. 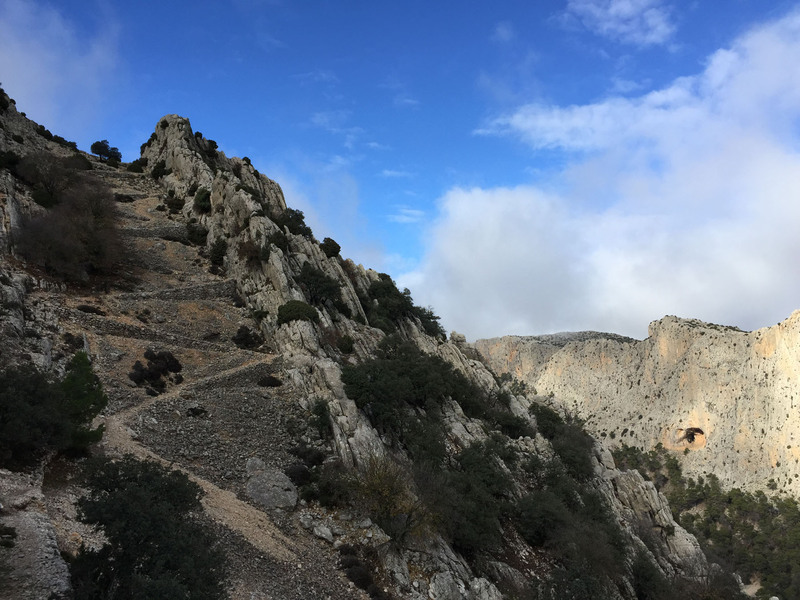 The contrast to our recent mountain hideaways and peaceful mountain walks was stark, to the point where we could not find a way to reconcile ourselves to staying here. 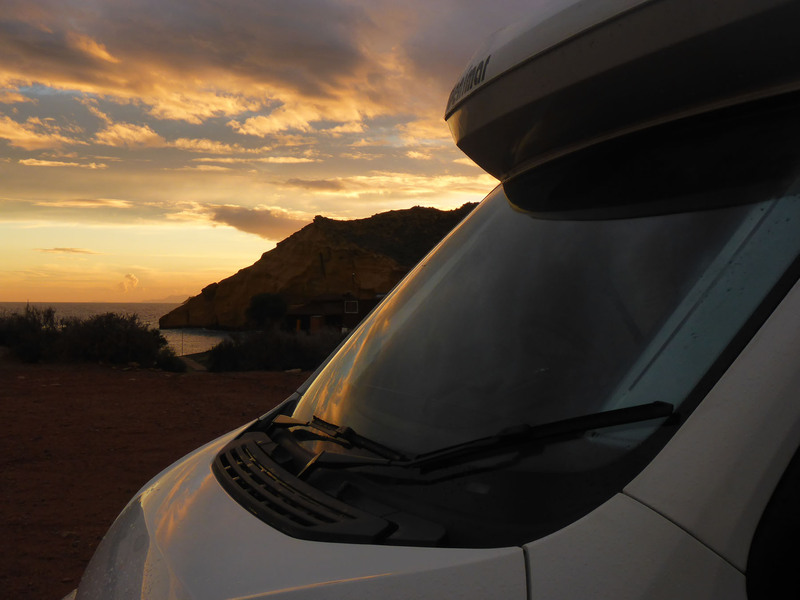 We continued on to Malaga, where we had several options for aires and thought we might enjoy a few days sightseeing or playing at the beach, but the over-developed and over-crowded coast just flicked an off-switch in us and we had to now find a Plan C (Malaga was already Plan B). 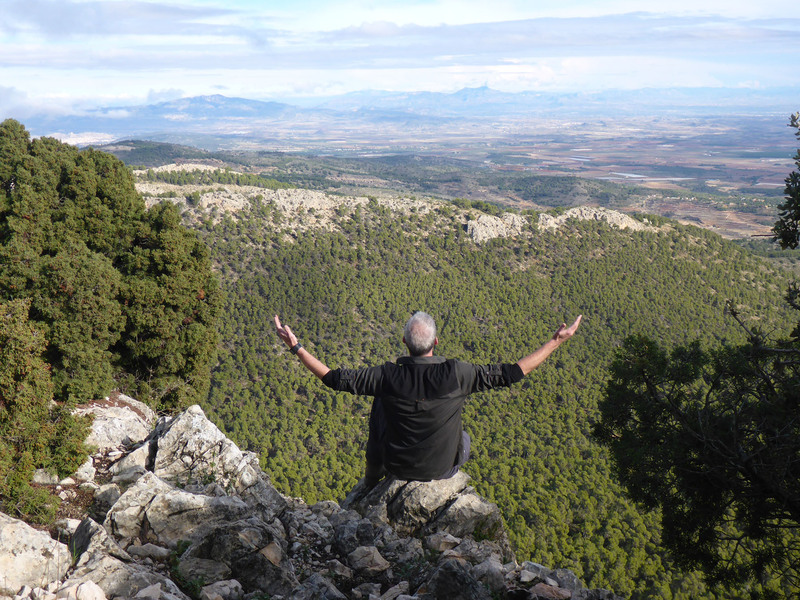 So we headed back into the interior, away from the coast, to a town with two free aires – Antequera. 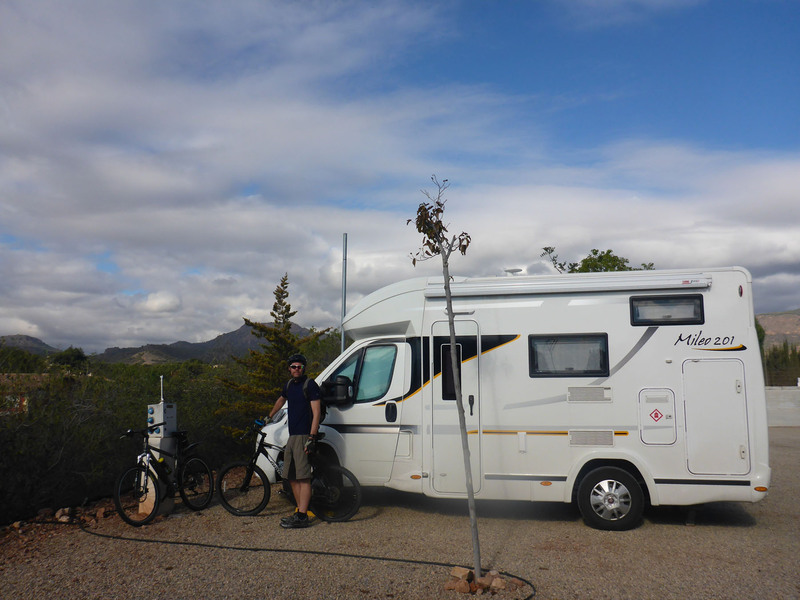 We first parked up in an aire in the centre of town, outisde a football stadium. Unfortunate timing, as this Sunday night the stadium was host to a large local derby game, and the crowds soon started to arrive in force. 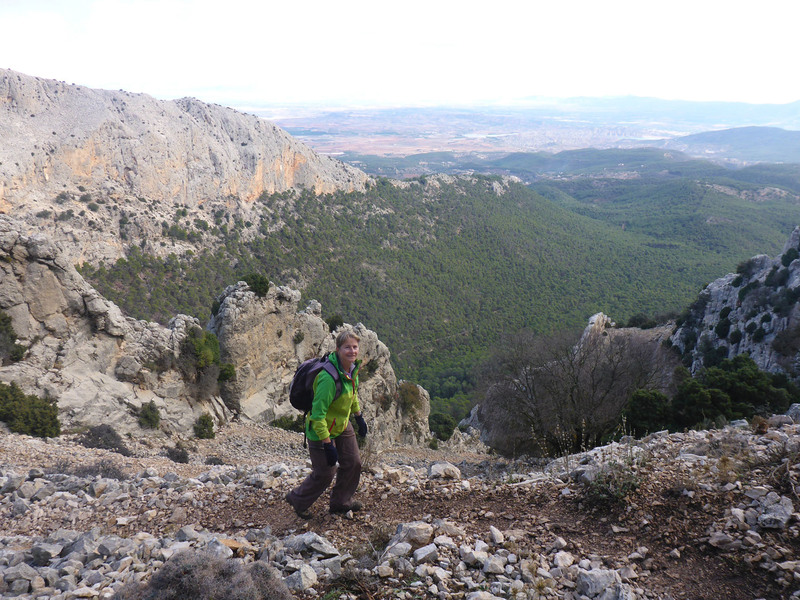 With the roaring and announcements and a very long day of driving, we decided to head to the other, much more peaceful spot for the night, at the visitor centre on the top of a local hillside called El Torcal. Low cloud was dropping in shortly after we arrived and within a few more minutes the entire mountain took on a spooky, eerie quality, looking moody and dark. 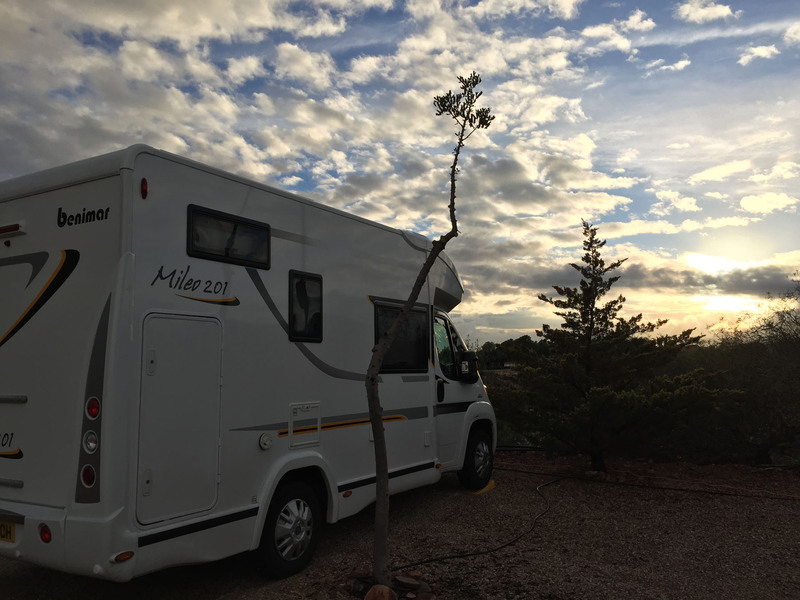 The temperature dropped rapidly and for the first time we had to turn our heating on and leave it running all night, for fear of our systems freezing. 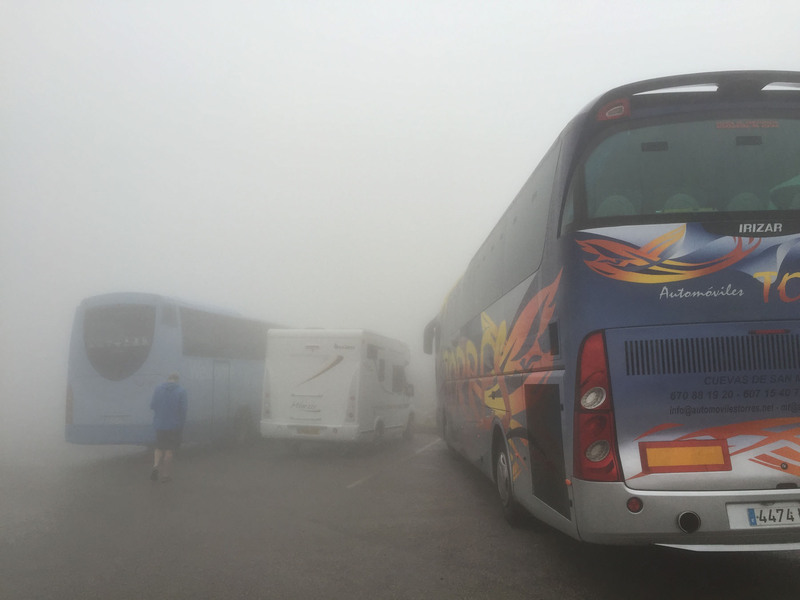 The next morning was still a white-out, and we found ourselves the filling in a sandwich between two huge tourist buses visiting for the day. 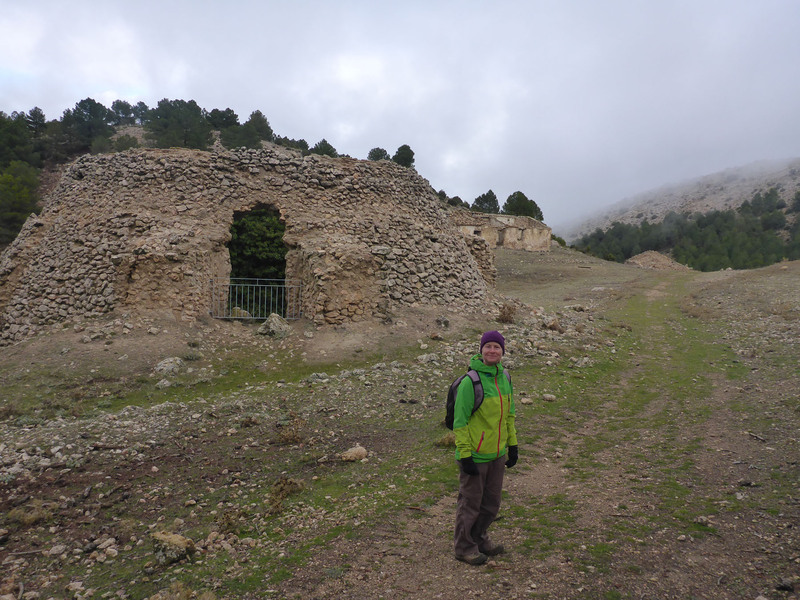 We walked over to the visitor centre, only 20 metres away but not visible from our parking spot in the morning mist and low cloud, to find a café full of forlorn tourists who had paid for a bus trip to El Toral, only to see nothing. 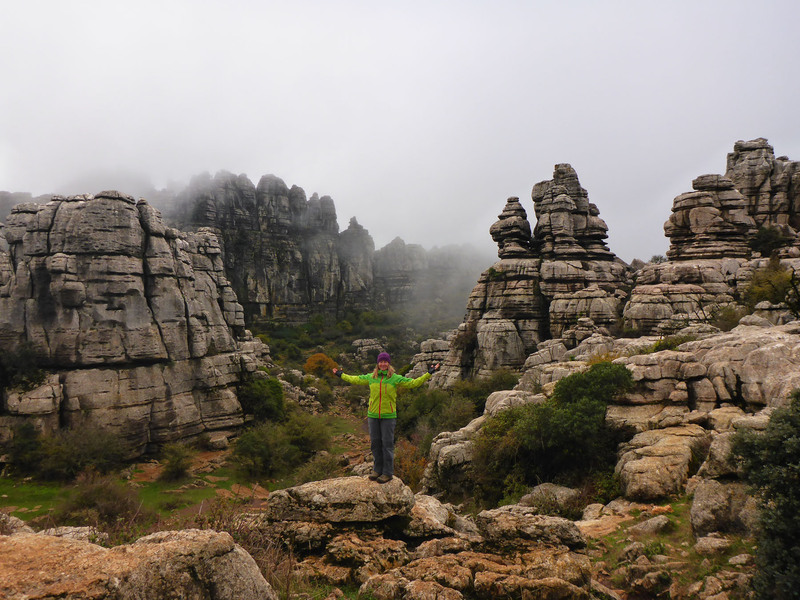 We spent three days in total around Antequera. 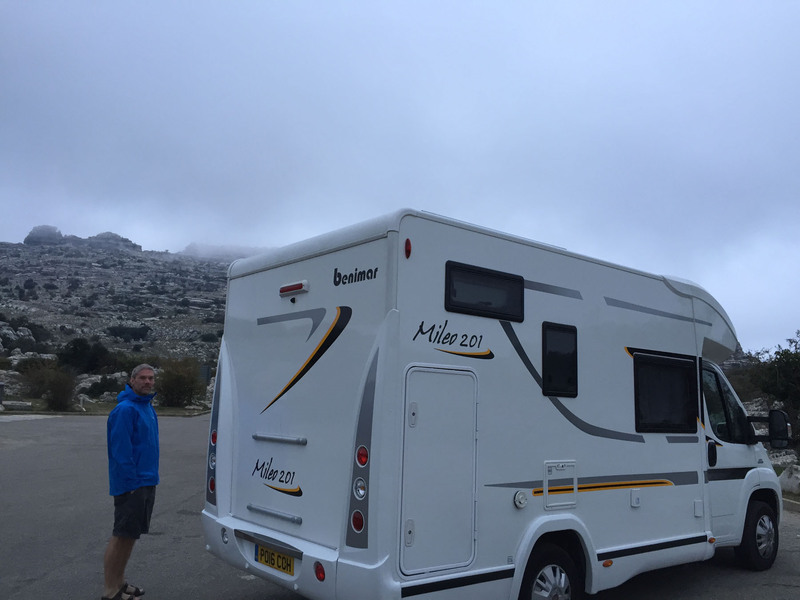 Although the weather was generally poor, the parking was free, the town centre pretty and there was free wifi available locally. The main bonus was that there was an official Benimar garage located in town and we managed to have a few nagging issues with Benny looked at and repaired under warranty. 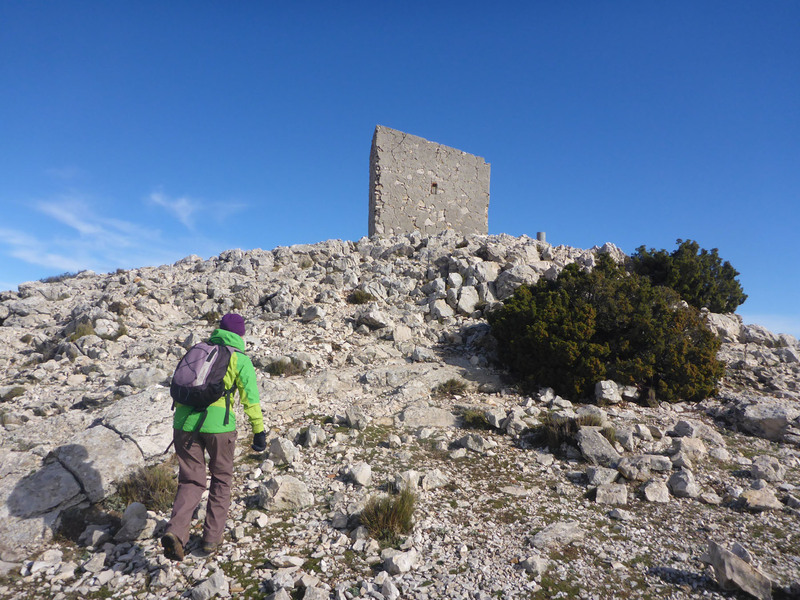 The walk around El Torcal in the one short weather window we had was a definite highlight, and worth waiting for. 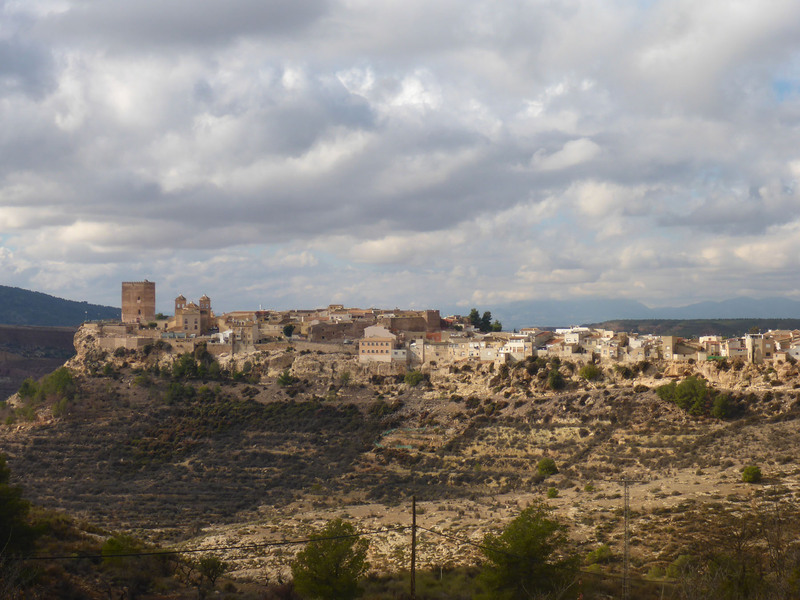 From here we drove straight to Granada. 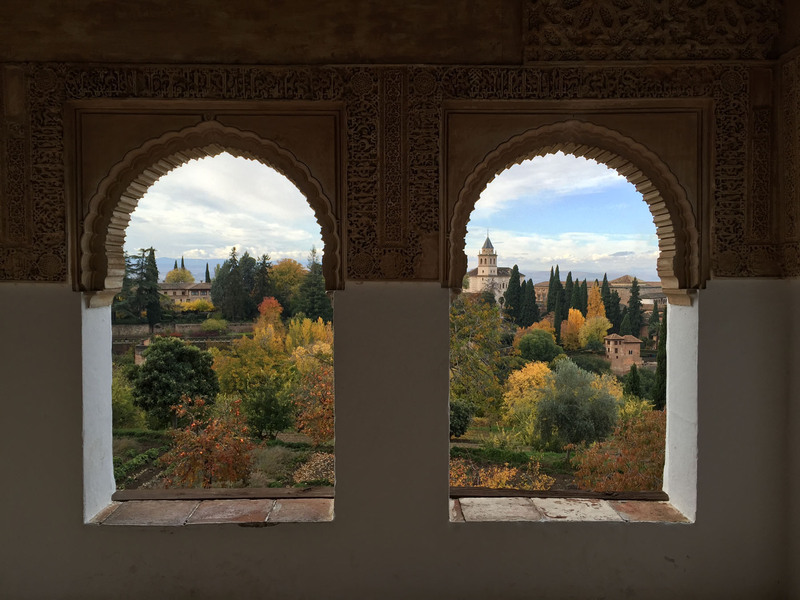 Our initial impressions of Granada were of a large and sprawling city, spread wide across the valley, below the backdrop of impressively craggy and snowy mountains. On approach, it looked larger than Seville, but this was no doubt because we never had a vantage point there where we could see the suburbs stretching out behind the more compact centre. The rain fell incessantly as we drove in, slightly dampening our spirits. 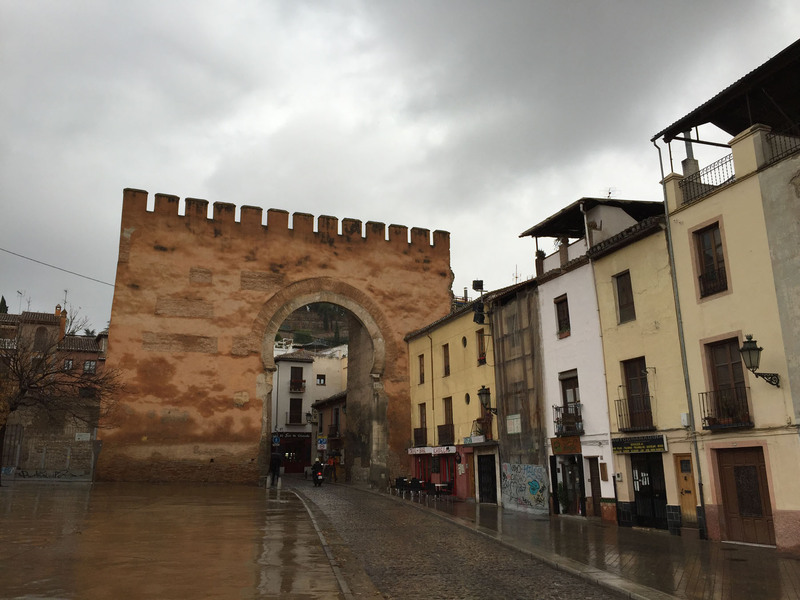 Despite this, we caught a local bus from our campsite in La Zubia to the Palacio de Congresos de Granada to begin our visit. 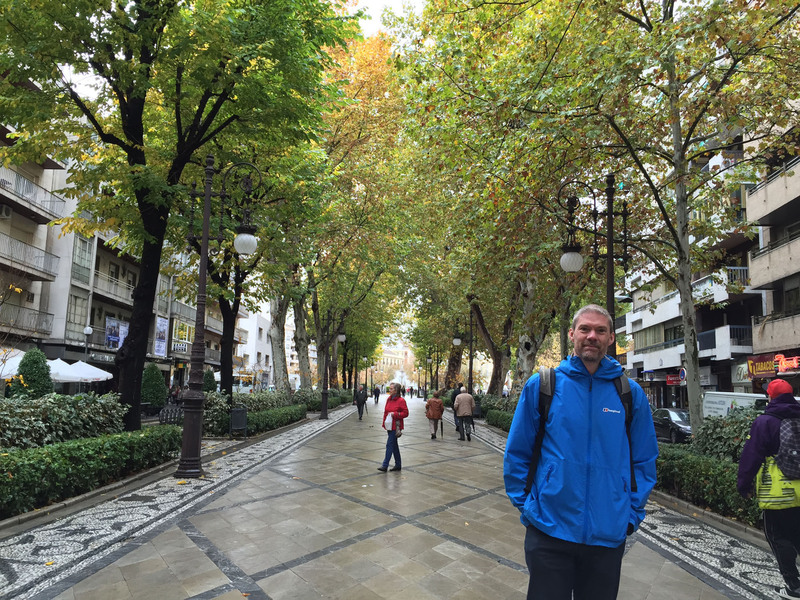 We crossed the River Genil and headed through parks and tree lined streets, dodging puddles bouncing with the persistently dropping rain. 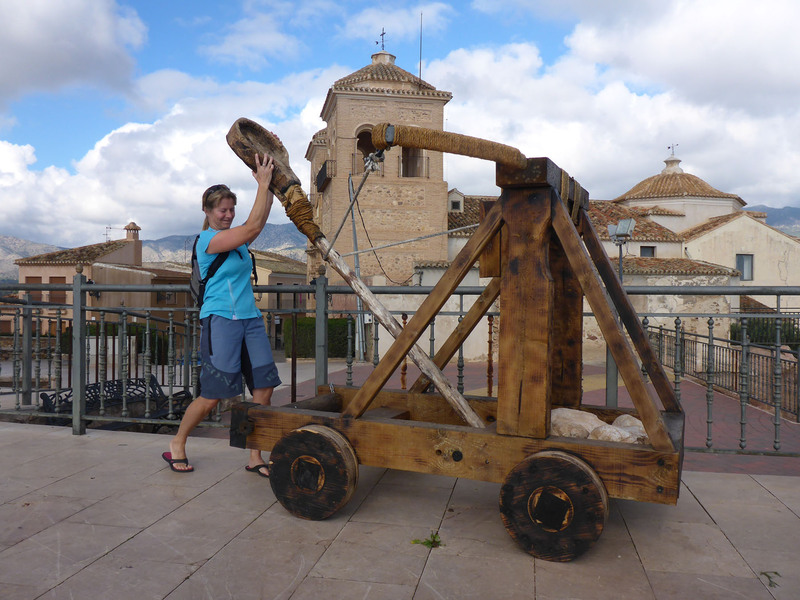 It seemed much more gritty, urban and real than previous cities we’d visited in Spain; political graffiti, rundown buildings and rubbish strewn back streets, when away from the main historic centre. It may have been the rainy grey day that influenced our initial assessment, emphasising the grey underbelly and dark corners. A brightly shining sun can help to hide a multitude of issues and make everything look new and clean, or lead the observer to overlook faults. The city as seen in the worst of conditions may be the most honest viewing. 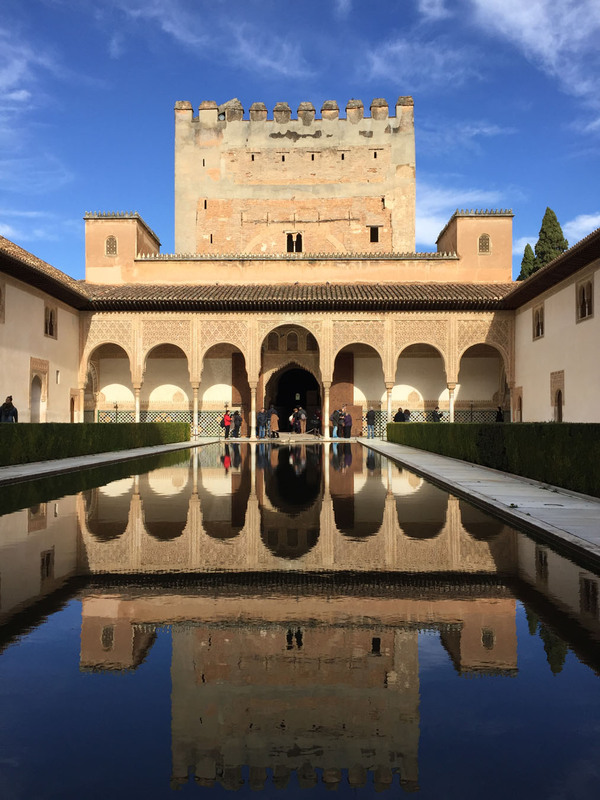 No visit to Granada would be complete without seeing the Alhambra, but with tickets needing to be booked one day in advance, that was to be our main activity the following day. Seeing the historic city centre was our main goal this day. 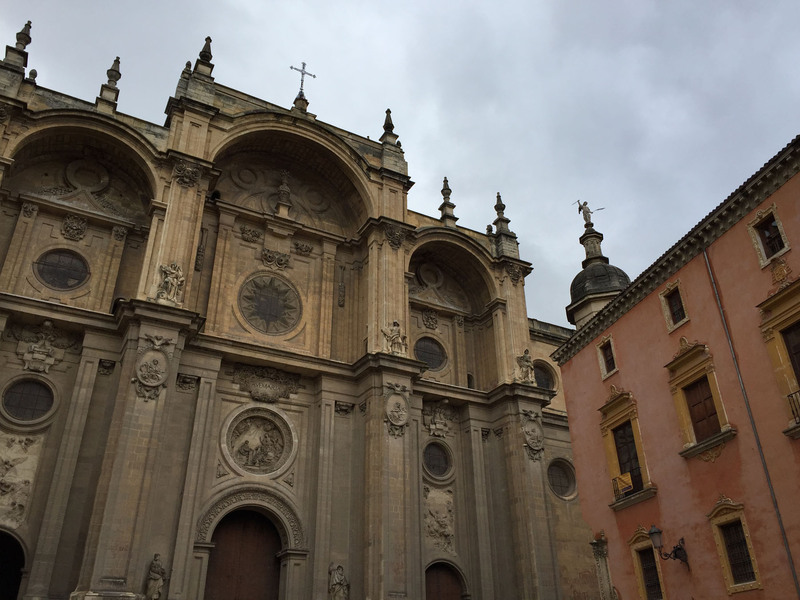 We had a look at the Catedral de Granada with the adjacent, attached, Iglesia del Sagrario. The small streets around the quarter were filled with tourist shops selling the usual trinkets and postcards, although mostly empty as the rain dripped sullenly off their projecting awnings, usually in place to protect browsers from the sun. To get our bearings a little, we decided to head for a high vantage point to look out over the city. 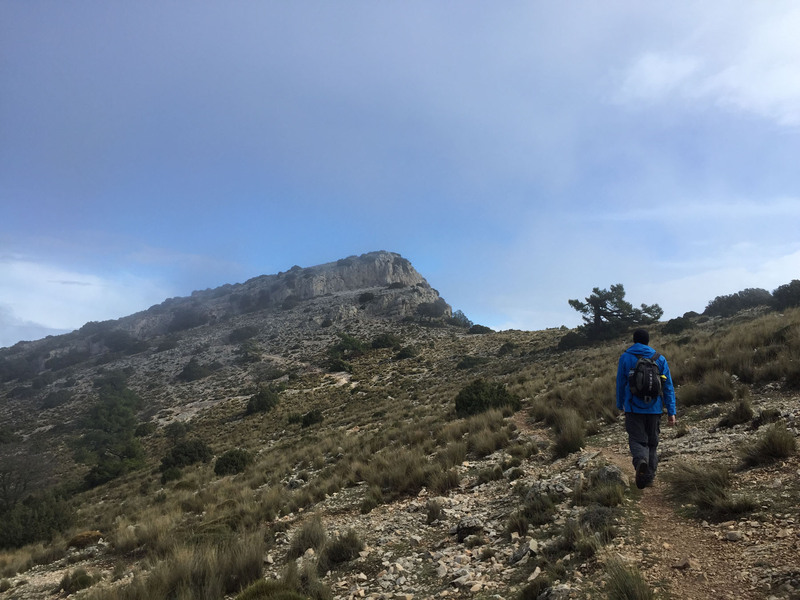 We walked up and through the narrow backstreets of El Albaicín, enjoying the climb and the maze-like routes as we reached various viewpoints, each offering a different perspective over Granada. 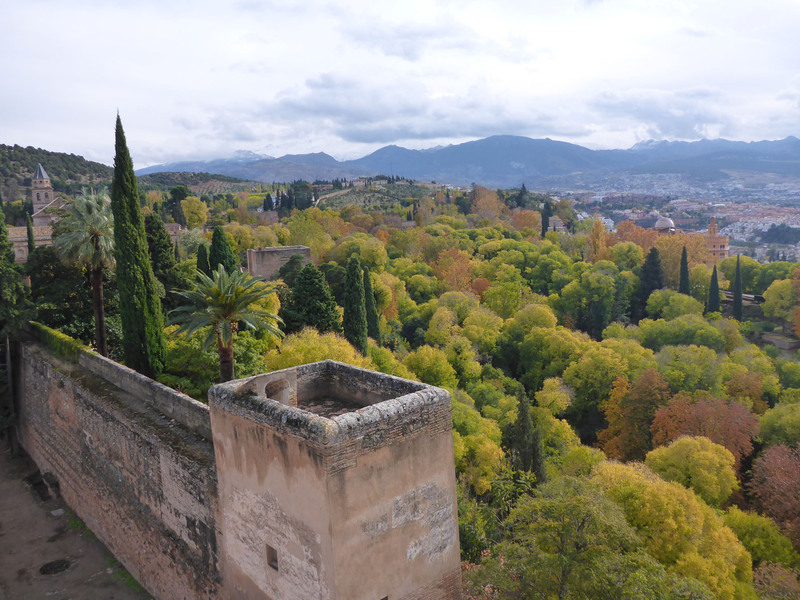 The Mirador de Los Carvajales was the first reached, a small park area with neat benching and shade trees that opened up to view across to the impressive walled complex of the Alhambra opposite. 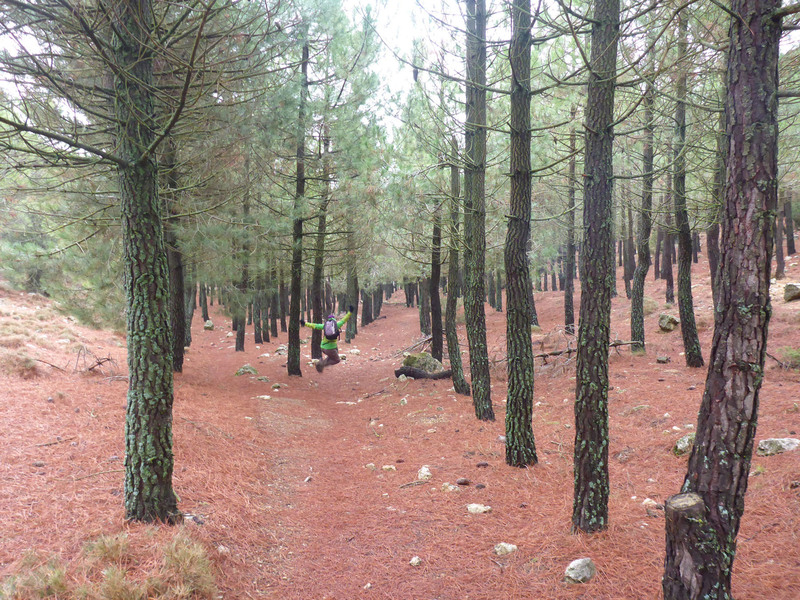 This far south in Spain the colours of autumn were just catching up and the tall trees around the walls looked beautifully varied in reds and yellows, even through the dull hazy drizzle. 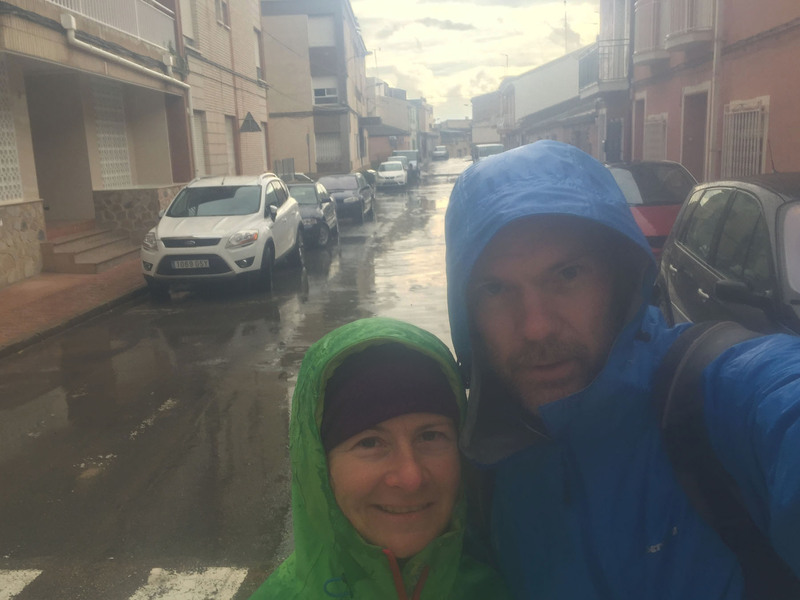 Continuing up through the residential streets, raindrops dripping off our hoods, we received odd looks from locals suggesting that we were definitely gringos locos for being out in such weather. 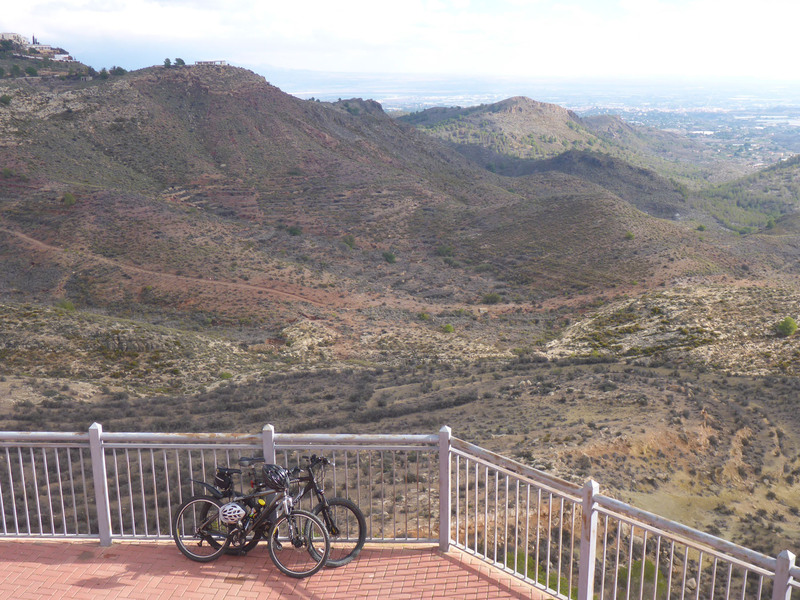 After much wandering, we reached the Mirador San Nicolás and found we were not the only mad tourists today, as a large group on a tour were positioned here, also enjoying the view. 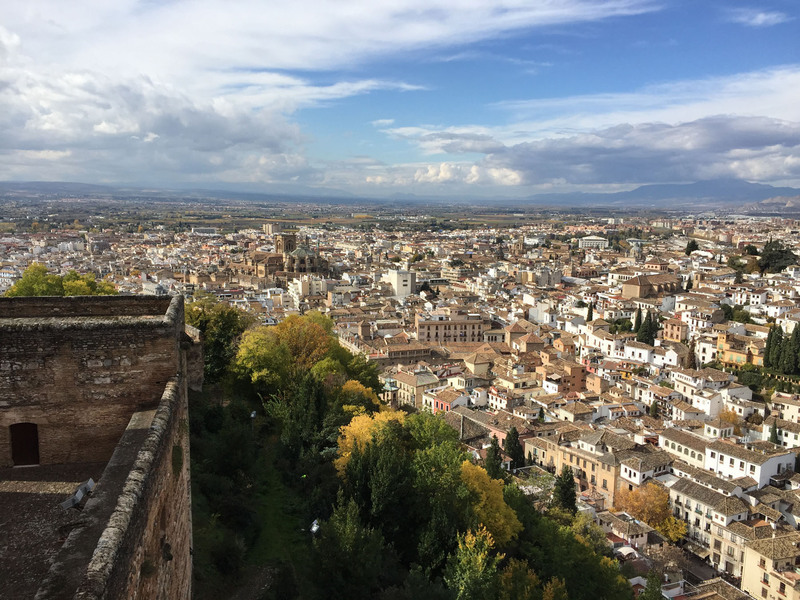 This was definitely the largest and most impressive mirador we found in El Albaicín, looking out over both the Alhambra and the central area of Granada. 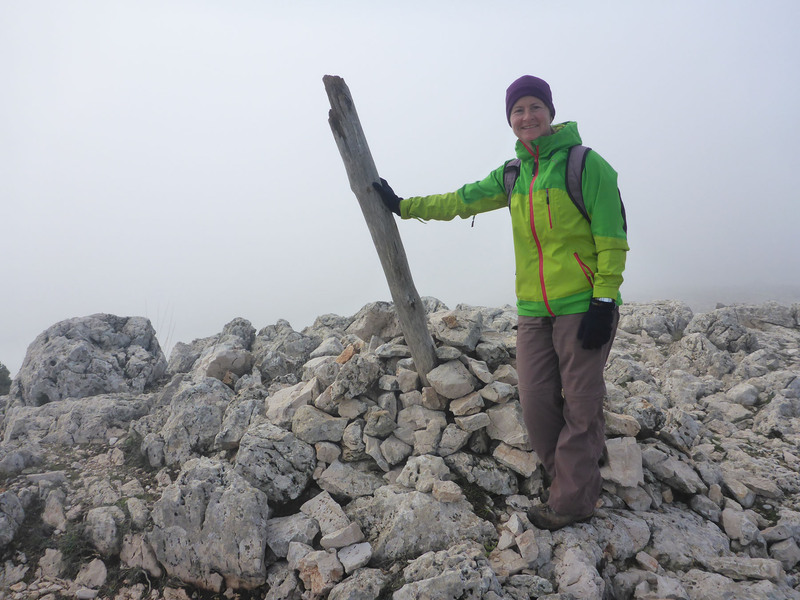 Undaunted by the rain, we proceeded further up the hill, where Mirador de San Cristobal was the next viewpoint reached, on a corner near a large road leading up the mountain behind. 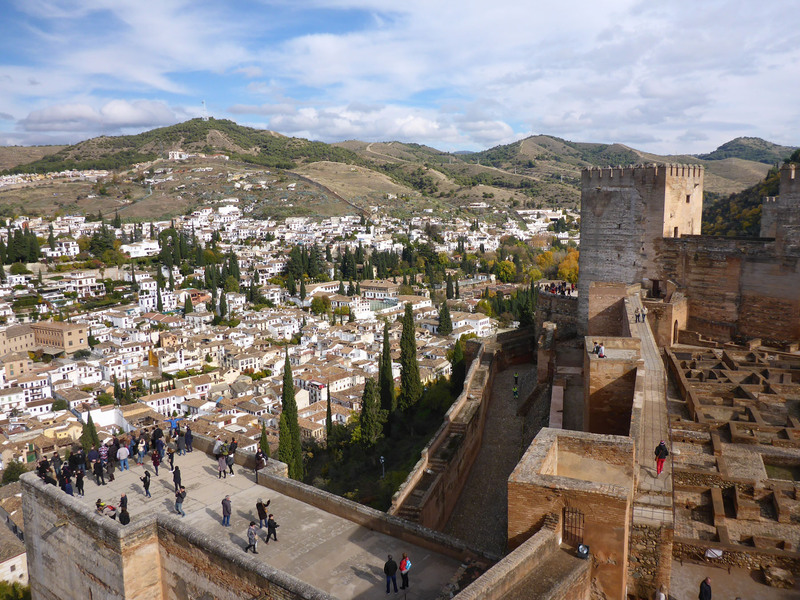 This was a small area with a less impressive view over the Alhambra, so we didn’t linger too long. 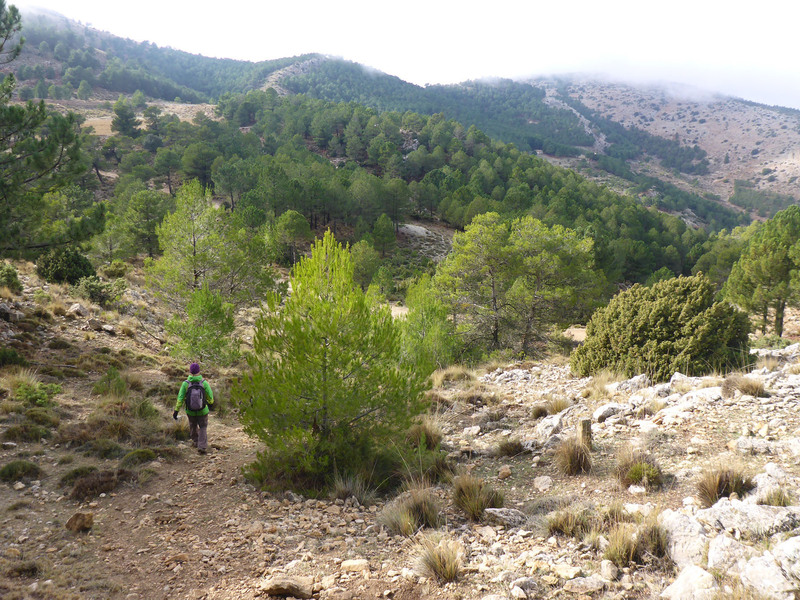 We walked back down this hill a short distance, before turning left and dropping quickly down a long set of winding graffiti-covered steps and back to the city centre street level. 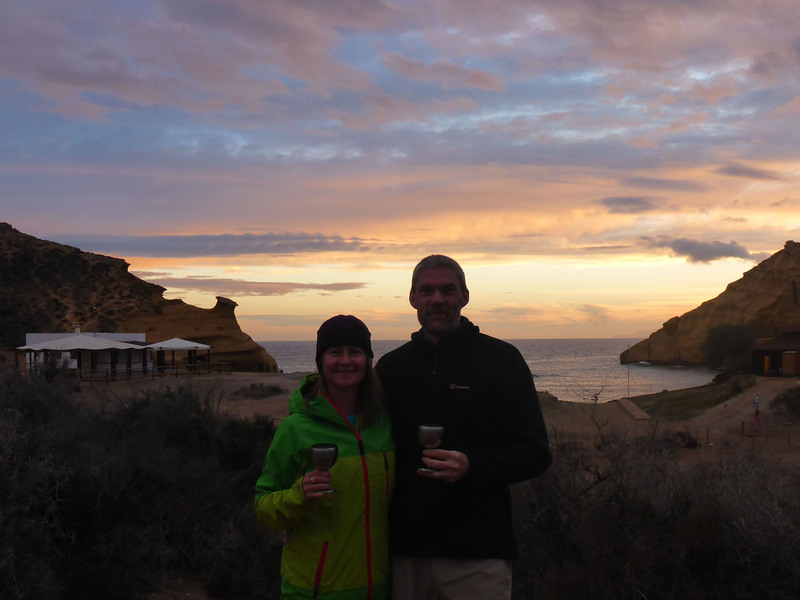 We found a small local café and enjoyed lunch out, a rare treat for us, whist the rain finally subsided outside. We walked back through the same streets of the centre as before, but this time with the sun appearing. 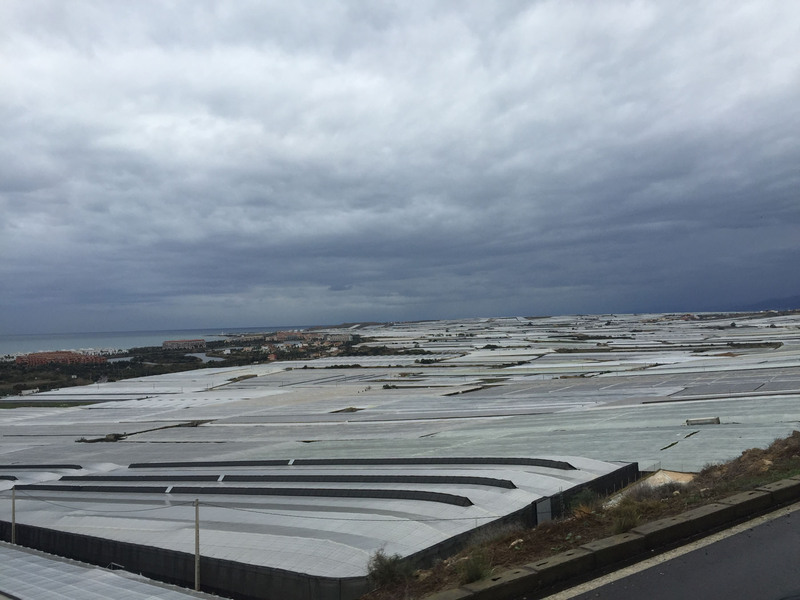 Certain plazas took on a different feel with the new-found brightness, and we felt glad to have seen them in varied conditions, allowing both the comparison and understanding that first impressions do not always tell the full story. Catching the same local bus into the centre, we first stopped off to check out the writing and photography of a display set up in a local park. 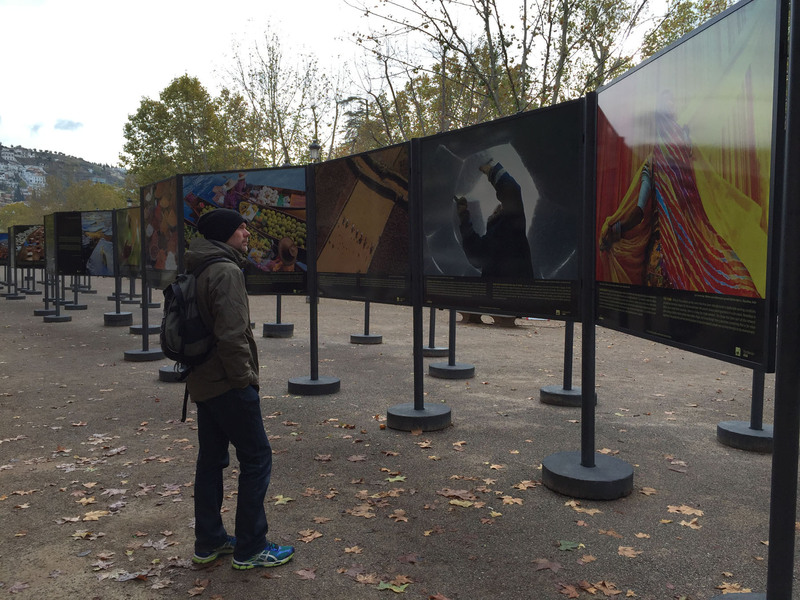 It was an installation dealing with environmental concerns and issues, and how individuals can be effective in being part of the solution. The photography was beautiful and poignant, and the underlying ideals simply stated and well-written; combined they made a collection of powerful, moving statements. From here we walked up through the town, to reach the main entrance of the Alhambra complex. 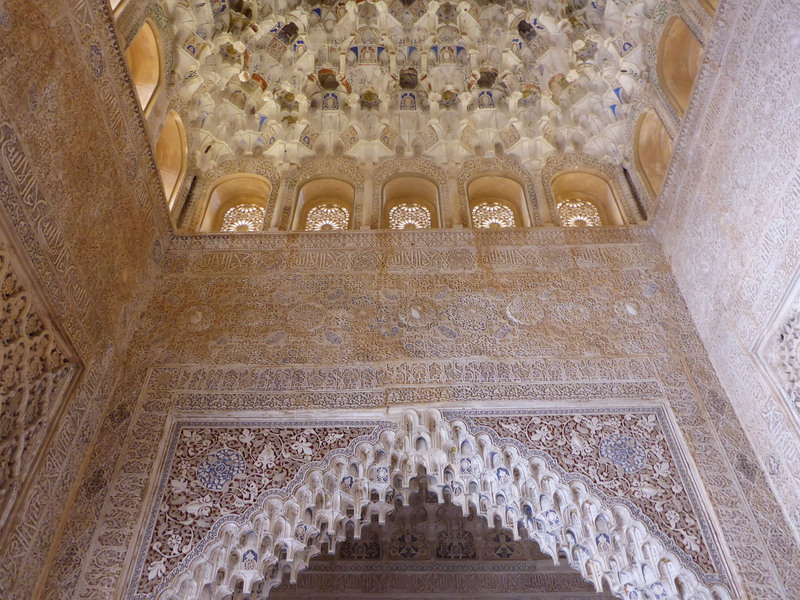 I had been in the Alhambra before, over fifteen years ago, under very different circumstances. It was an organised bus trip from a beach resort, in the height of summer and was over 40 degrees C. All I could remember was the oppressive heat and terrible crowds, along with a few vague memories of certain attractive corners and spaces within the main palace. This time it was damp and dull, and this at least ensured both the air temperature and the crowds were reduced to manageable levels, making for a very different visiting experience. We collected our pre-ordered tickets and proceeded into the complex, then first on to the higher positioned GeneralLife building. 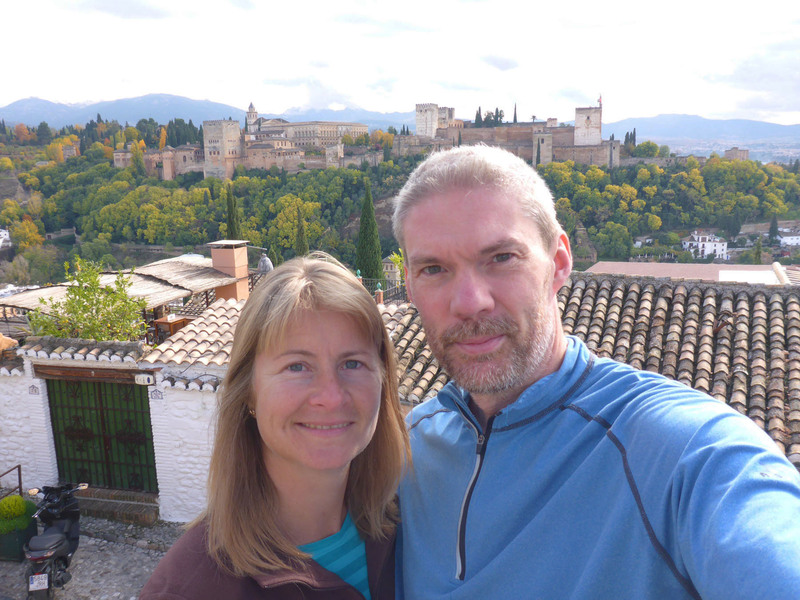 This both avoided the several tour groups heading straight for the Alhambra centre and afforded us wonderful views back over the walled portion of the complex. 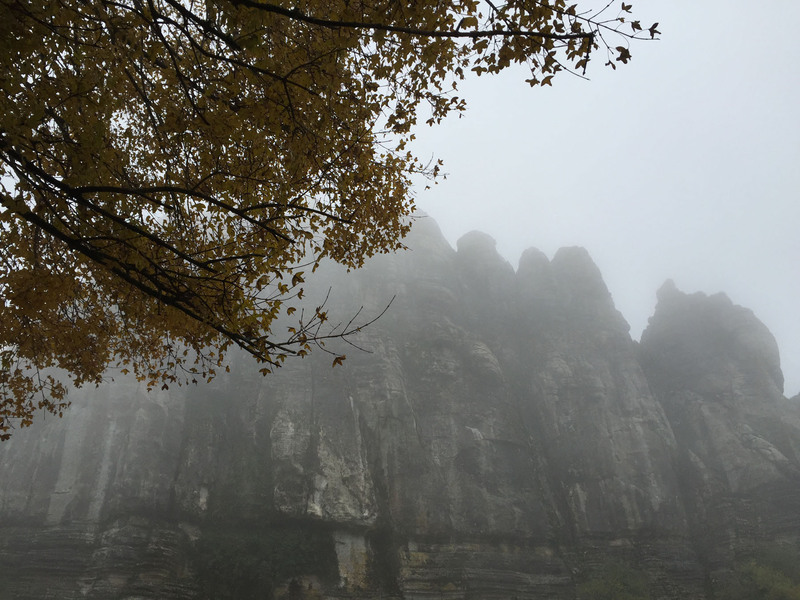 In the short moments it took us to collect tickets and walk up the hill to the Palace of the GeneralLife, the clouds parted. 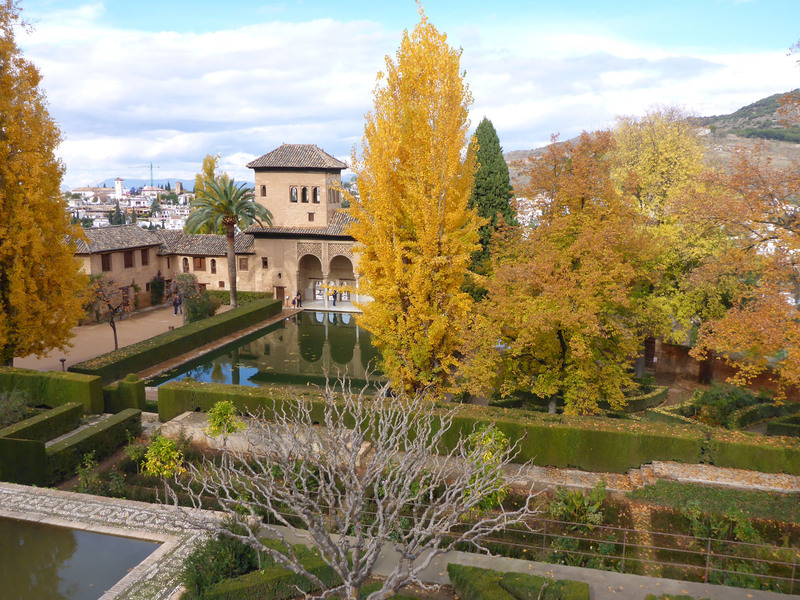 We could see across to the Partial gardens and the Nasrid Palaces from our vantage point in the gardens. 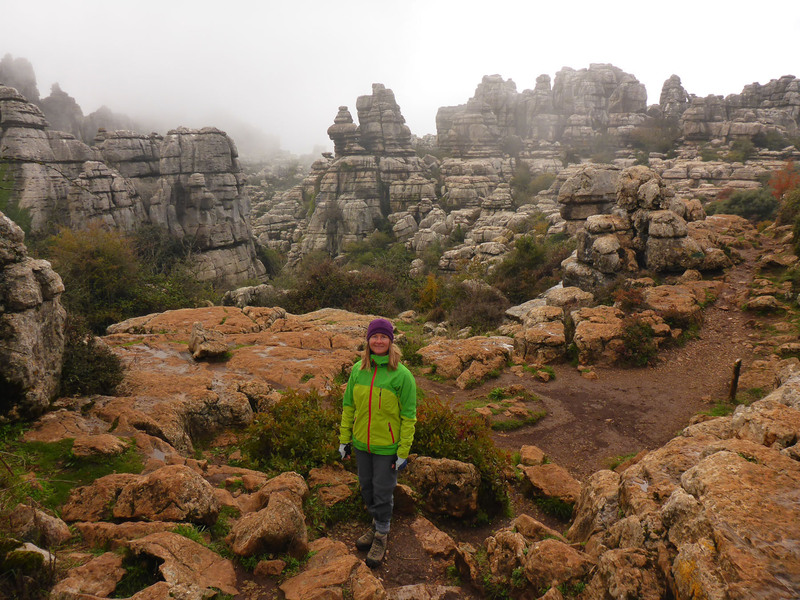 The weather was now altogether different, so we were very glad that we waited to visit this day. The sun was trying hard to come out, with blue sky slowly winning its battle with the grey clouds. 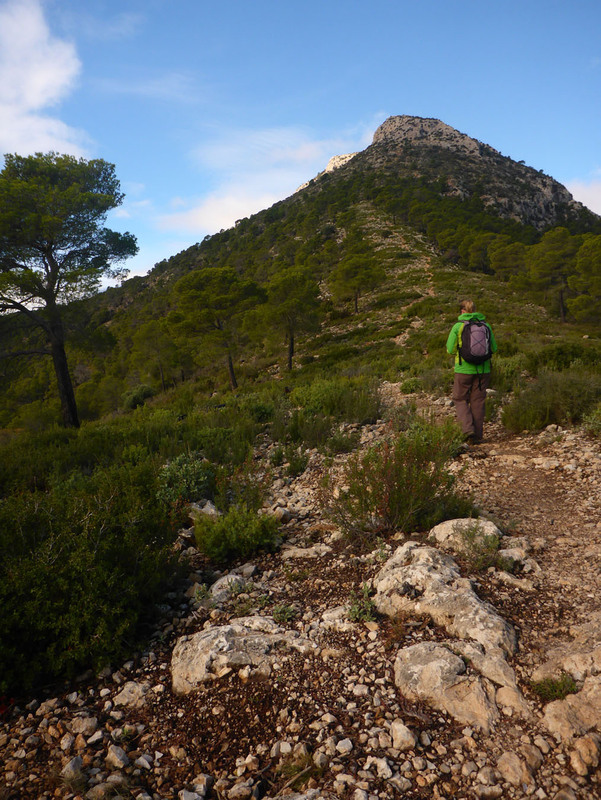 This helped lift our whole visit, with a wonderful quality of light hitting certain corners or trees as we passed, adding another dimension to everything. 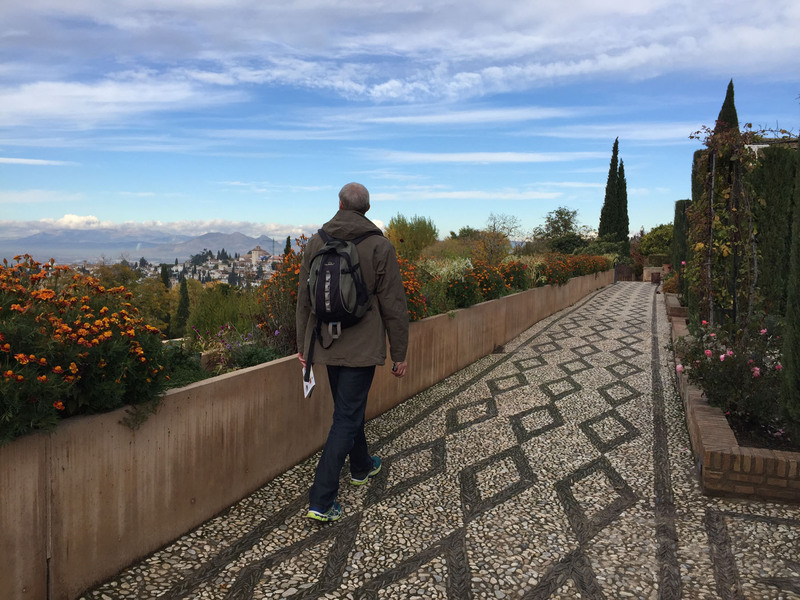 After exploring the Palace of the GeneralLife and enjoying the expansive views over the city of Granada and the Alhambra, we headed back in the direction of the latter. We passed across the bridge leading through the gate in the stone walls, before walking along a tree lined avenue that passed the convent. 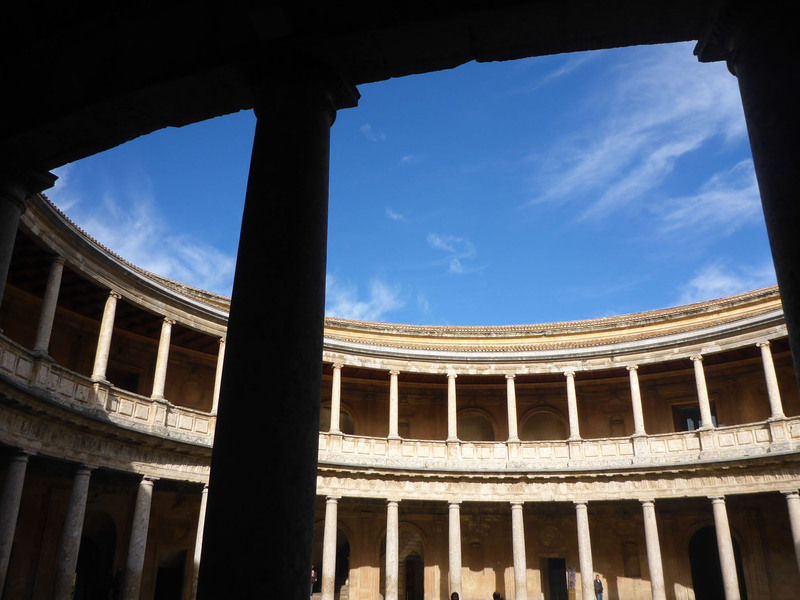 We arrived at the Santa María de la Alhambra church, then looked around the Palacio de Carlos V, a circular civic building, with intriguing columns of polished concrete with exposed aggregate, that houses museums and fine art galleries. 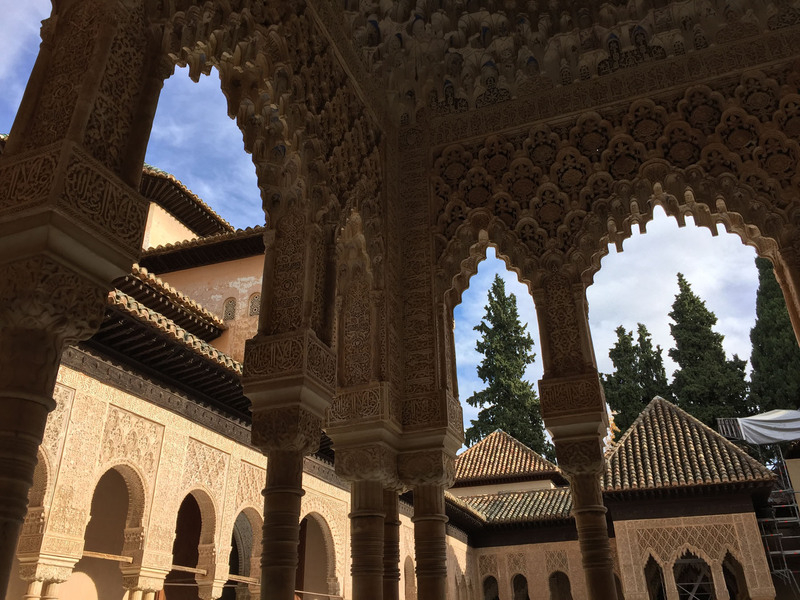 We sat a while in the Plaza de los Aljibes to eat our lunch and enjoy the warm sun on our backs, surrounded by hundreds of screaming kids on an educational school outing, before joining the queue to see inside the Royal Palaces. 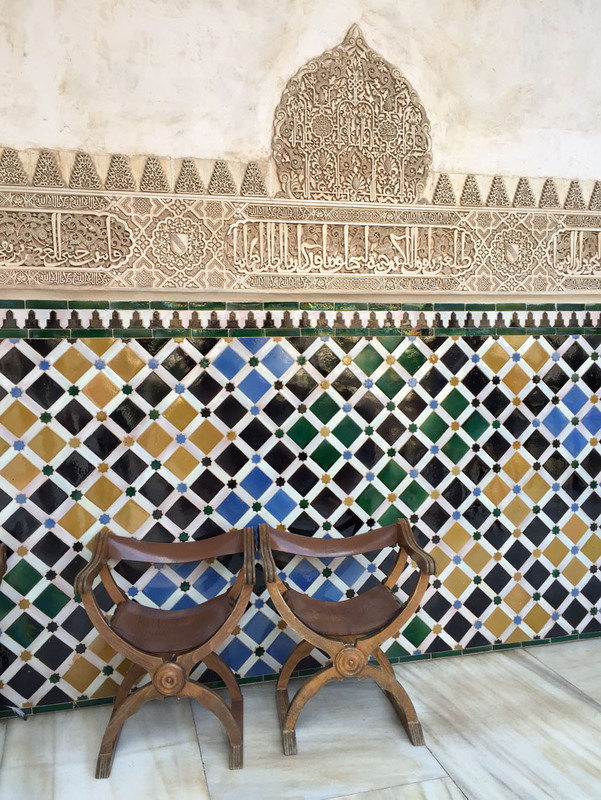 These were the portions I remembered from my previous visit – intricately carved plasterwork and colourful tiled mosaics in elaborate patterns, all similar in execution to those in the Alcázar, recently visited in Seville. 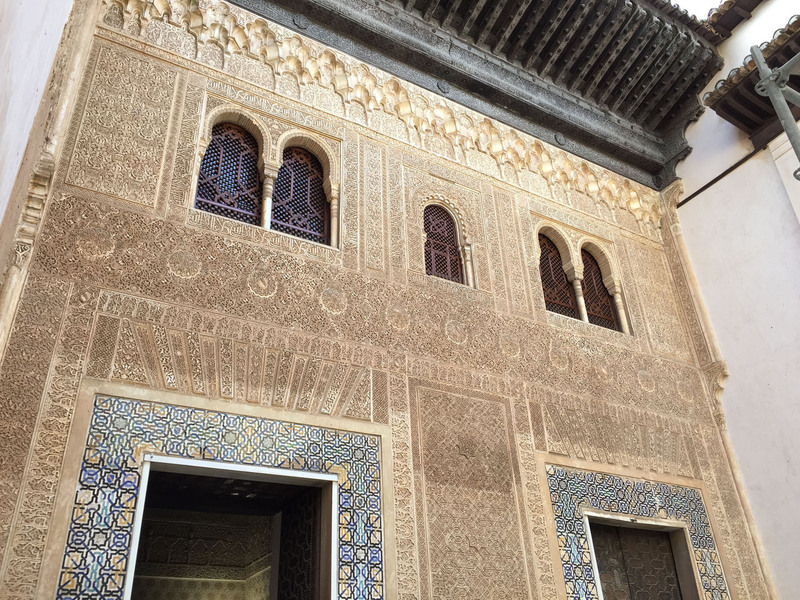 Each room seemed to be more complex and beautiful than the previous, culminating at the Patio de los Leones (Court of the Lions) and the Sala de los Reyes (Hall of the Kings). 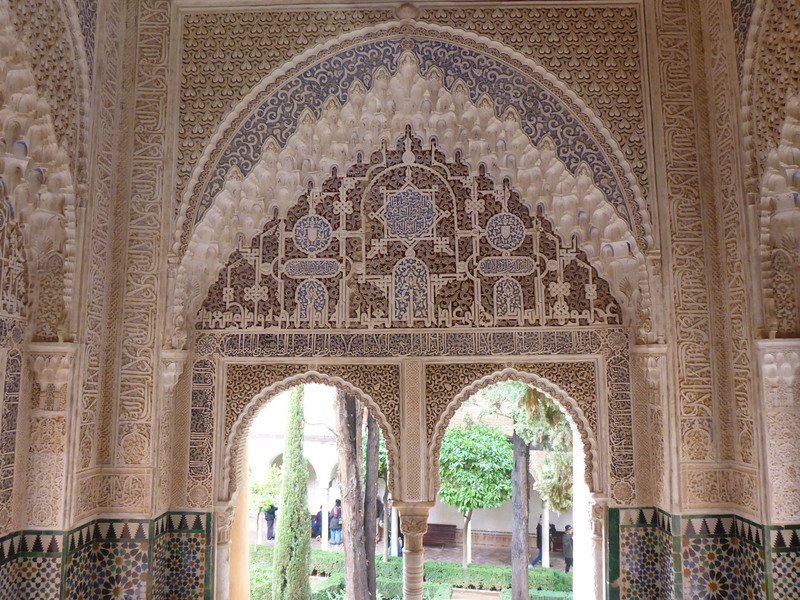 After exhausting all corners of the palaces, we ended up outside in the gardens, still with many plants in bloom. 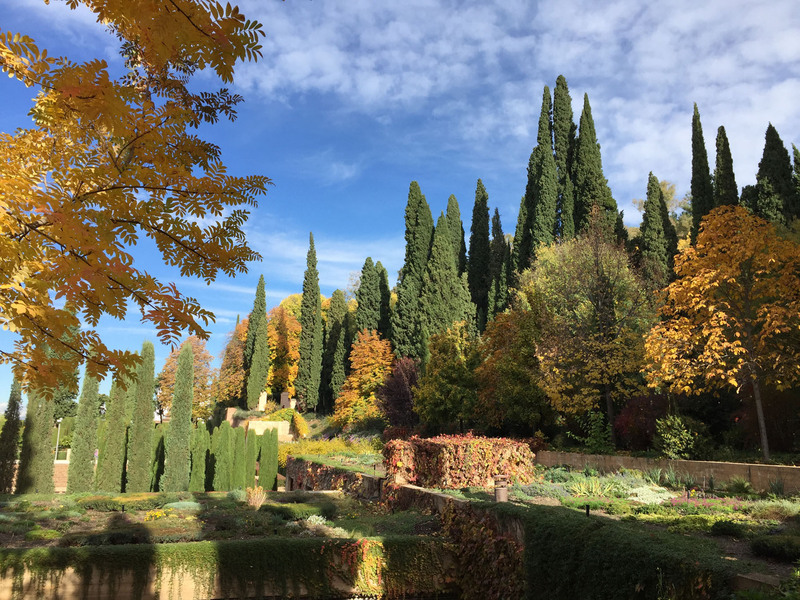 The flower beds and neatly arranged squares were dominated by tall black poplars with deeply bright yellow leaves, a delight in the midst of other autumnal highlights. 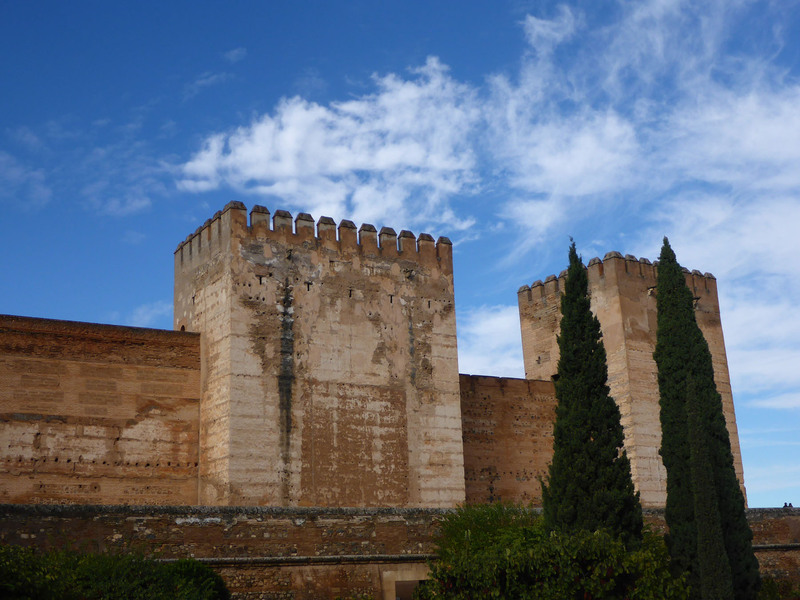 The final stage of our visit was to the Alcazaba, the military complex and oldest part of the Alhambra. 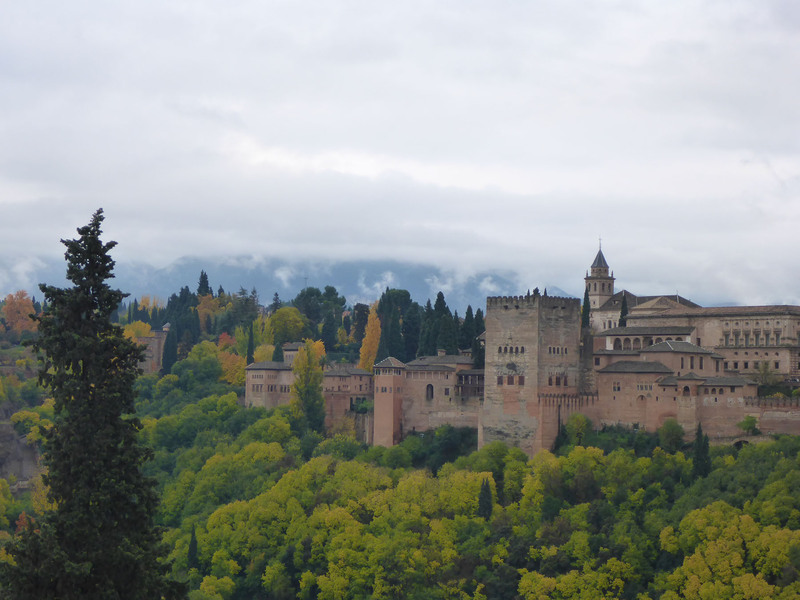 This area was the dominant feature of the Alhambra when viewed from the city; tall, robust yellow stone with high towers giving exceptional oversight over the surrounding lands. The walled enclosure was surrounded by landscaped gardens and tall trees, the soft edges blurring the concepts of security and beauty. 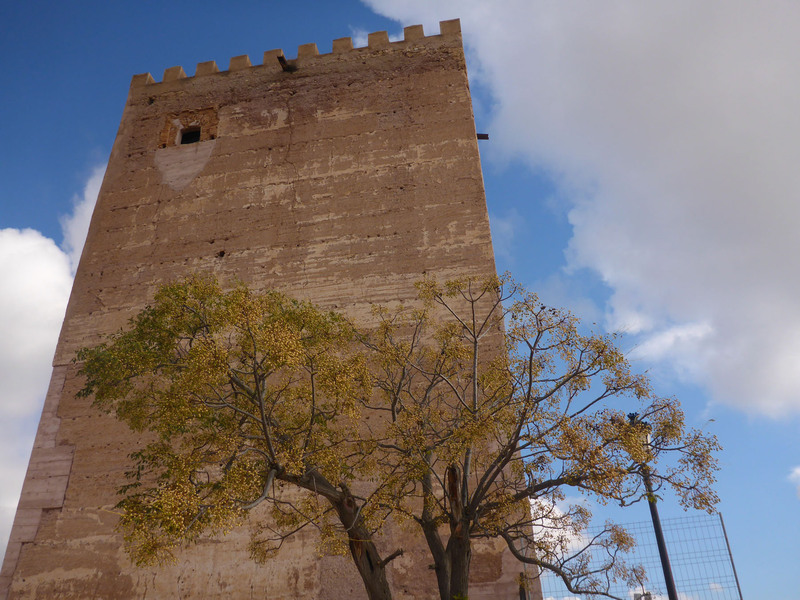 The highlight was the Torre de la Vela, the tallest watchtower at the end of the sharp end of the complex, commanding views right over the city to the snow-capped Sierra Nevada mountains beyond. 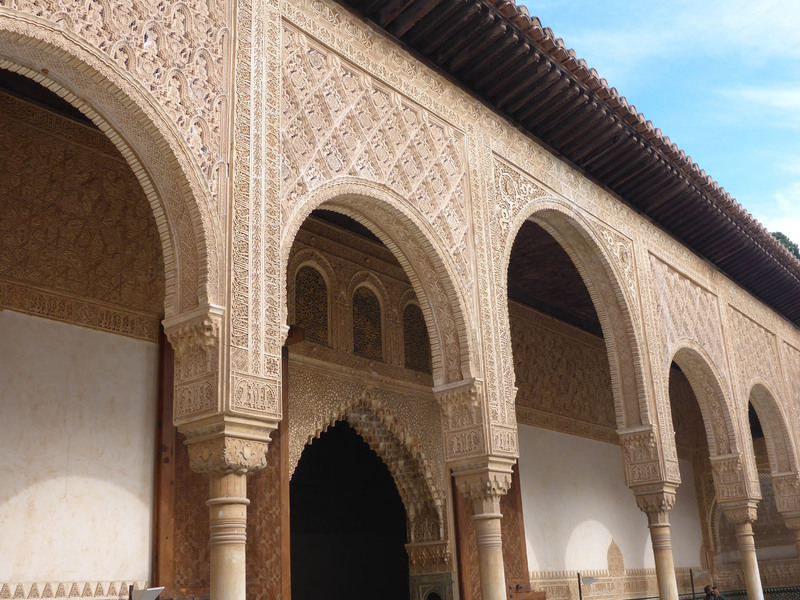 We walked slowly out of the palace complex, trying to absorb all the details. 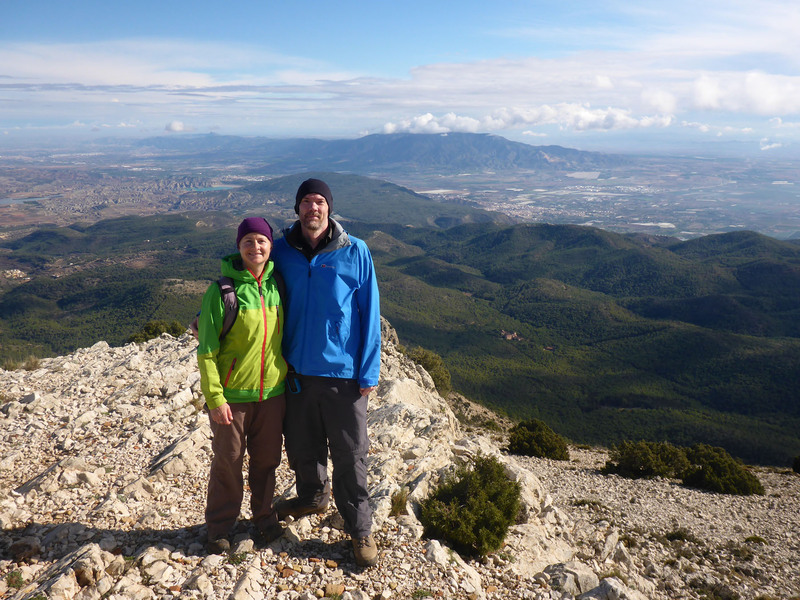 Afterwards, we walked again up through the El Albaicín, to revisit the miradors with views over the Alhambra, now that we had more of an understanding of the internal geography of the complex. The sun was now out, offering a very different viewing experience than the murky grey of the previous day. We picked out points opposite where we had recently stood. 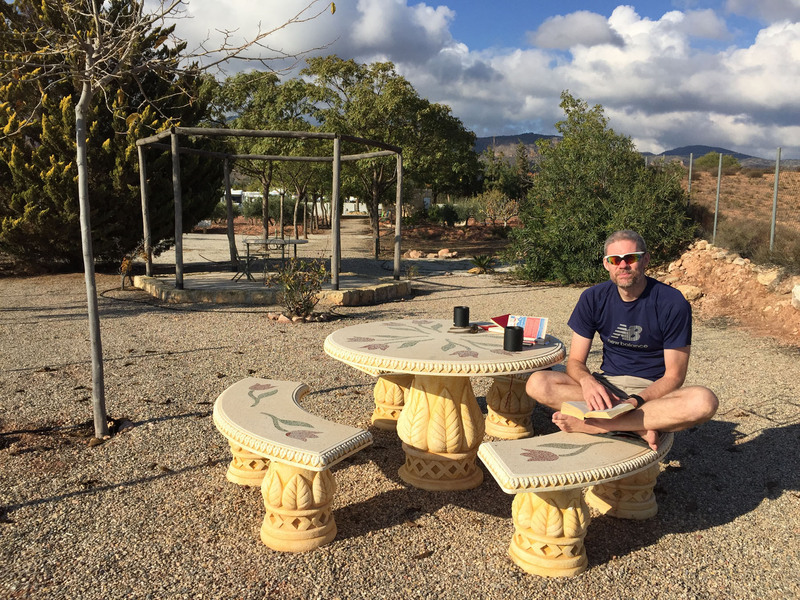 This entry was posted in In Spain, Our Travel Journal, Spain on Dec 8, 2016 by Aaron Hill.